I have been testing and researching a variety types of trailing and bracket orders on the oec trader platform. Although it looks intuitive I ran into some difficulties and I will be happy to post and share my findings and hopefully find other traders who also use the platform to post questions and exchange their research on this thread. I really like the oec platform and hope to be able to solve the few technical issues. I will try to post some details with pictures in a day or two, meanwhile would love to hear from others what are their challenges with oec trailing and bracket orders? So I started playing more with OEC bracket orders and here is some basic functionality. little TRIANGLE on the top of the DOM. BUY BRACKET and SELL BRACKET. FACTOR in Points, Currency, Exact Price or Ticks. After engaging the Bracket order and selecting the Factor and typing in the SELL/BUY LIMIT TARGET FACTORS and SELL/BUY STOP LOSS FACTORS, you can very fast hoover up and down the DOM price ladder and click on the BUY or SELL side and place instant BRACKET ORDERS to your liking. typed in can be a blessing. 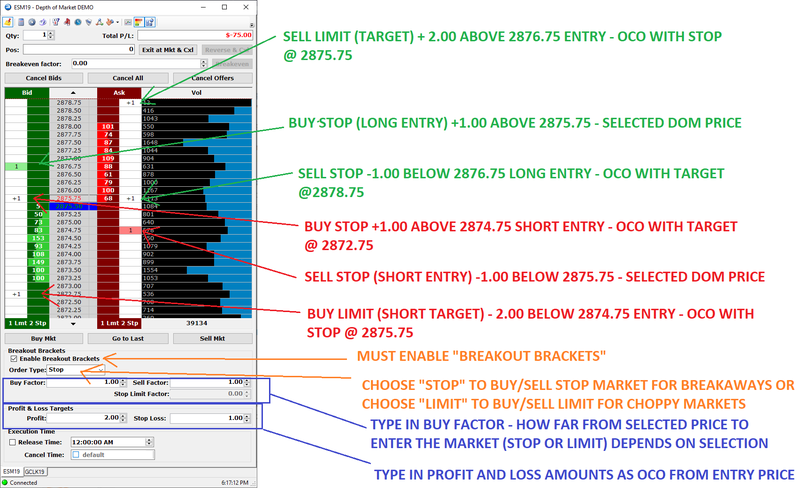 of BUY LIMIT BRACKETS with pre-determined exit SELL LIMIT (Target) and SELL STOP (stoploss) and then just waiting to see if the market pulls back a bit to get me in at a better price but also place another BUY STOP order (which can be achieved by simply hoovering over DOM price above the current market price - in case the market wants to breakaway and I don’t miss an entrance alltogether). entrance (then I cancel the higher BUY STOP BRACKET), or if the market keep going higher then I would accept the worse entrance and cancel my lower entrance BUY LIMIT bracket, or keep it still active all together if I am ok with buying 2x the size as per one’s trading risk parameter. Now, once the trader clicks over the currently selected DOM price, the series of trades will automatically appear across the DOM (See Attached Pic). once filled I want to get stopped at a loss of max -1.00 point or 2875.75, also I want to exit the long trade at a +2.00 points or 2878.75 (the highest order on the picture). I want to exit if that short goes up to 2875.75 (-1.00 point) or exit at my target of +2.00 or 2872.75 (lowest order on the DOM attached). This is very helpful for trader who are expecting big moves but not sure which direction but they know their max risk and profit targets before hand. Also, I am using a small target of +2.00 points and changed the DOM font to a smaller size just to showcase the orders that are working after clicking the selected price of 2875.75. Also, IF I wanted to enter the market at LIMIT ORDERS then the initial orders would be -1.00 point below for BUY LIMIT ENTRY and the short would be +1.00 above the current price for the SELL LIMIT (enter the market on the short side), the STOPs and TARGETS if -1.00 and +2.00 respectively would be calculated from the new LIMIT prices. THIS scenario would be more useful during CHOPPY markets when a trader doesn’t want to rush to get in on a STOP MARKET like in the previous example, but rather would like to wait for the market to PULL BACK to ENTER LONG or UPTICK to ENTER SHORT. the prices on the DOM by simply dragging the still outstanding orders up and down depending on one’s newly changed bias of the market. I find this ability to enter LONG and SHORT BRACKETS with STOPS and TARGETS a blessing since many times I place a series of manual orders and this is saving me time and gets me faster in the Exchange Book queue = less potential slippage, not to mention less missed entries! The below series of BRACKETS was entered with a ONE CLICK! @Project11 We at Optimus Futures cannot thank you enough for all the effort that you have made for the trailing stops research and the ongoing support you provide. I am happy to share my findings as I am researching the very issues and challenges other traders seem to be going through. I must say that Gain Capital Feed and their OEC Trader, iMobile and iWeb app has been performing well thus far. I am also slowly digging into Sierra Chart as my side by side for now. For now all the brackets I can find on the OEC Trader have to do with Entering the market long or short on a STOP or LIMIT (depending on the trader bias), automatic Targets coupled with Stops etc. One can place either single brackets LONG or SHORT or send a combination of LONG and SHORT separate bracket combos (which are super great for fast markets). I am now working to figure out a proper way to use the TRAILING STOPS and dynamic trailing stops and will post my finding soon as well. Meanwhile, I am using the Excel DDE functionality where I can trail any order and auto execute via Gain etc. but it’s beyond the scope of this particular thread. 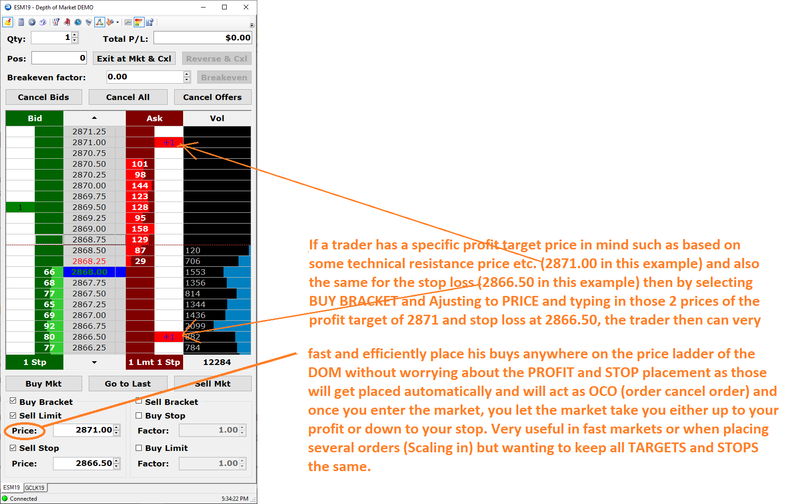 use and place the DYNAMIC TRAILING STOPS via the OEC Trader DOM. It was a bit confusing in the beginning but if one does it right it works like a charm. One must check the box: TRAILING STOP checkbox to activate the Trailing Stop Mechanism. It also changes the SELL STOP in BRACKET SECTIONS to SELL TRAIL STOP. 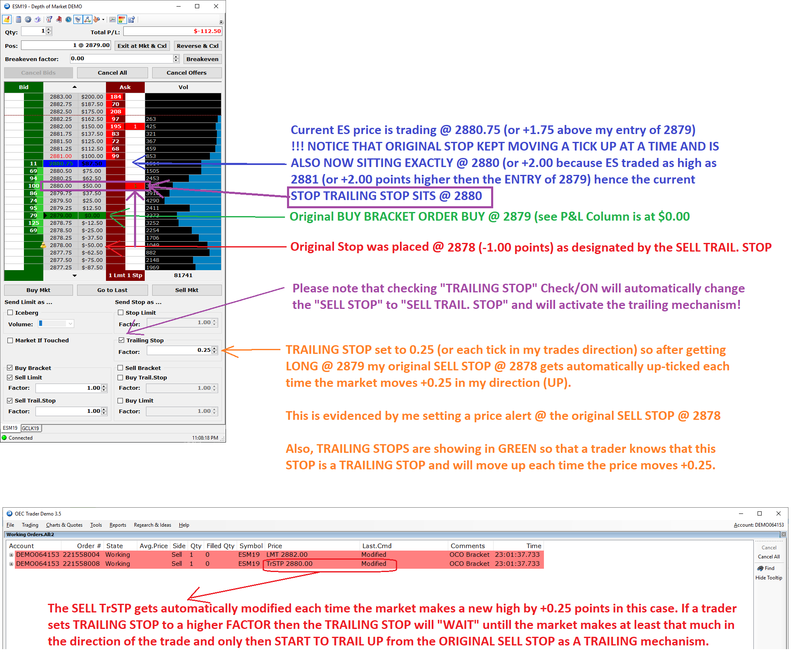 This means the Trailing Stop over will now override the original regular SELL STOP. second the market moves +0.25 or 1 tick in my direction (LONG in this case). was in this case 2879.00 (notice on the DOM the $0.00 in the P&L Column). The Trailing Stops work on OEC and once a trader tries it on DEMO a few times it will become clear how to navigate around and use this fantastic feature. move +1.00 in the trader’s direction and only then will it start Trailing the original stop upwards by a factor of +1.00, another words the market would have to move each time another +1.00 point to move the trail by +1.00. This a smart option if a trader wants to wait for at least a decent move in the direction before the trail moves up a step. It could avoid getting stopped out too early in comparison with the 0.25 trail. Again, it all depends on the time frame of the trade. Tight scalpers may want to keep the trail at 0.25 while momentum traders at +1.00 or higher, IMHO. Thank you so much for following up on this thread, I’m sure many traders down the line will find this information very helpful. I’d also like to mention that for anyone interested, you can also place Advanced Order Types (OSO, OCO, Complex, Straddle, Strangle, etc) along with Advanced Order Specs (Trailing Stop, Trailing Limit, Brackets, Iceberg, etc) within the Order Ticket window. This can be opened by navigating to Trading > Order Tickets > Standard you can also use the Ctrl + 1 shortcut on your keyboard. I felt this was worth mentioning because it provides an alternative solution for those traders who do not actually place orders through the DOM. 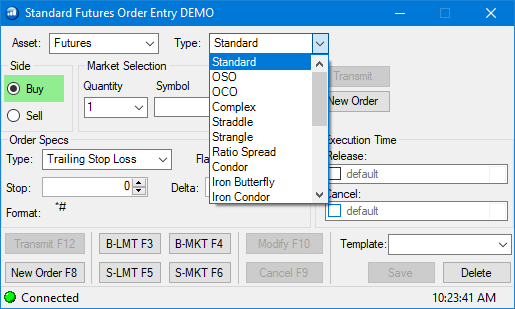 The order entry window allows users to place more additional order types (like those mentioned above) and also allows for advanced tactics such as delayed execution/cancel times. Feel free to look at the Order Entry windows below to take a look at the order types and specs that can be configured. I also wanted to mention the order entry window for a specific reason, Delta. 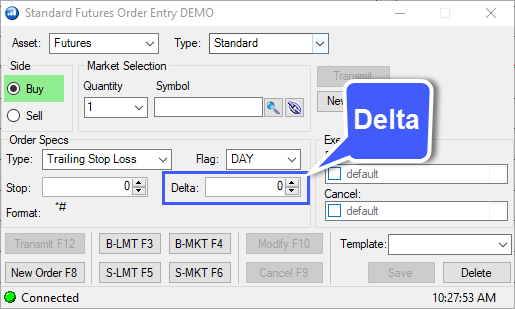 You’ll notice that if you configure a trailing order under a standard order type, you’ll be presented with a Delta field as shown below. This has caused issues for traders in the past because there’s no clear definition of what Delta means. You’ll notice that if you switch your order type to an OCO or OSO, the Delta field will disappear and instead you’ll be presented with a Factor field as it is shown in the DOM. After reaching out to Gain Capital, we’ve determined that Delta is apparently just another word for factor. Factor refers to an incremental numeric unit used as a specific value to increase of decrease the stop order by, i.e., .50 in the first box increases the stop value by the factor of .50; The same concept works the second factor box in that it affects the Limit. According to Gain customer support, " All delta is, is the factor. So, when the market moves by factor(delta) the TRL STP moves." If you plan on trading through the order ticket, you can use trailing orders with OCO and OSO types as well. 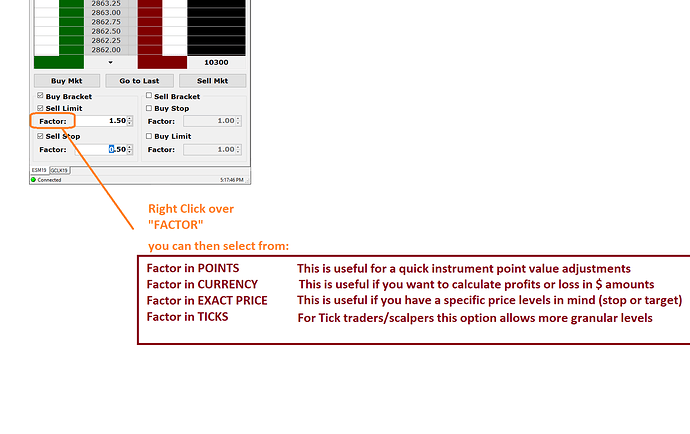 Under these order types, factor is displayed clearly (not delta) as mentioned briefly above. 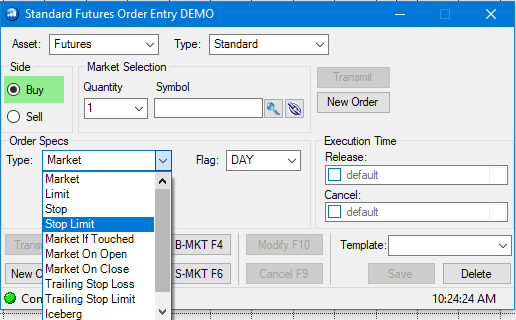 So as you can see, Gain Trader (OEC) offers quite a few alternatives to placing bracket, trailing, and OCO orders on the platform. It is ultimately up to the trader which method they’d like to use, but with the information provided by @Project11, this gives a clear starting point for traders to approach this topic with. If anyone has additional input to this topic, feel free to post a reply. We’d love to hear what you have to say about this. Once again, thank you @Project11 for your contribution, this was extremely informative and helpful! another bracket in the opposite direction of the now open position. Is there a way to override this? I tried going to bracket order options but there is only a section on how to group fills but not how to override the open position and keep allowing to place new brackets. 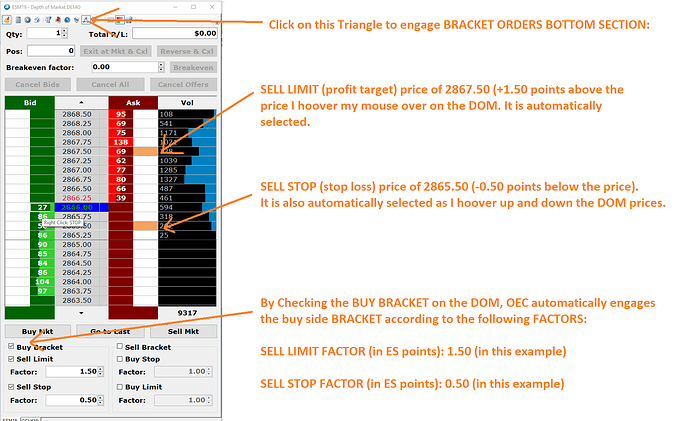 Place a New Buy/Sell Order and Couple it with a series of BUY&SELL OCO orders (a full bracket) where what I am trying to achieve is again: Being Able to place both buy and sell bracket(oco) orders without regarding the current open position.